Our last DogCation contest got such a terrific response, we're doing it again. Enter here for a chance to win a VIP Napa Valley DogCation at the Napa River Inn. Spend a wine country getaway at the Napa River Inn without worrying that your pets are missing all the fun. 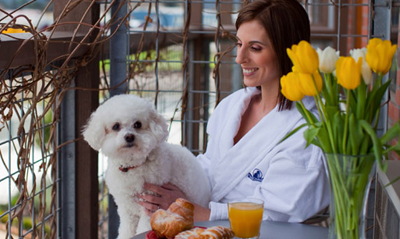 The Very Important Pet (VIP) program at this Napa pet-friendly hotel demonstrates the desire to make sure that you, your family, and your pet fully enjoy your vacation time together. Discover the ultimate pet-friendly Napa Valley lodging at Napa River Inn with this unique VIP program.